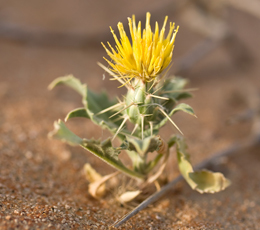 Germination in the arid rangelands of the UAE occurs as an 'event' following a mid-winter to spring rainfall. A fence line study of the germination events was conducted in 2005 and 2006 to identify the response to differential grazing regimes. Fifty-six 1m² seedling plots were destructively sampled each season. Heavy grazing reduced species richness and diversity without significantly reducing seedling density. Both annual and perennial species were impacted, though the reduction in richness of the annual species was less pronounced than the natural variation among locations. Direct grazing of seedlings is limited to a few weeks, due to the short annual plant life span. Reduction of the perennial seedling density and species richness was likely caused by the reduced size of adults plants under grazing. Recruitment of perennial species could be affected by heavy grazing, leading to loss of habitat, though under moderate grazing levels this could easily be compensated by greater survival.